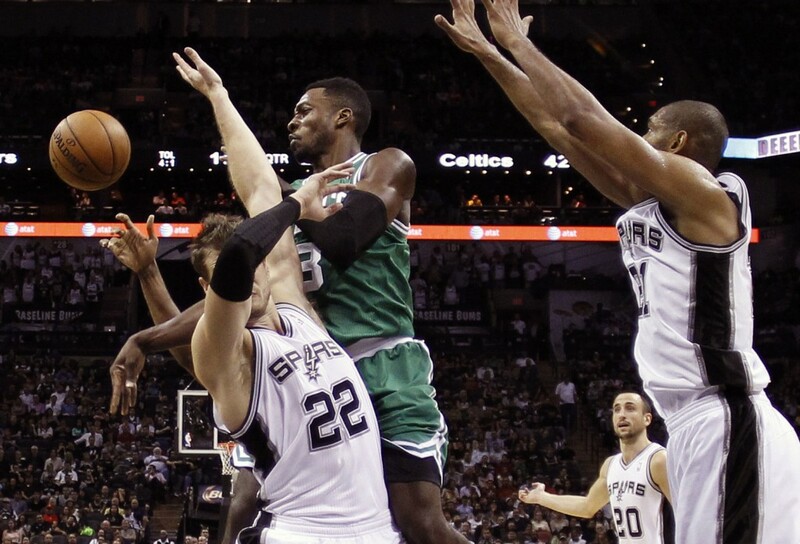 San Antonio hands Boston its fifth straight loss. SAN ANTONIO — Tony Parker scored 19 points and the San Antonio Spurs beat the Boston Celtics 104-93 Wednesday night, remaining undefeated at home. There were 10 lead changes and 14 ties in the first half, as neither team was able to sustain any momentum. San Antonio was able to pull away midway through the third quarter behind strong individual efforts by Leonard, Parker and Manu Ginobili. Leonard keyed the resurgence, scoring 10 of 12 points, including a 3-pointer that put San Antonio ahead 61-52. Parker made two dazzling layups, first presenting the ball with his right hand to draw a defender out of the lane and spinning back for a layup between defenders and then spinning away from a defender in the lane for a layup on the right side of the basket. Ginobili literally wrapped a pass around a defender, tossing behind around a charging Brandon Bass to find Diaw cutting to the basket. After scoring only two points in the Spurs’ previous home game against Washington, Duncan made the game’s first two baskets as the team targeted him early. He finished 3 of 13 but was 7 of 8 on free throws while also grabbing nine rebounds. NOTES: Boston’s Keith Bogans was not with the team due to an undisclosed illness. … San Antonio’s Big Three of Duncan, Parker and Ginobili have played 629 games together, trailing only Boston’s trio of Robert Parish, Kevin McHale and Larry Bird by 100 games.